Plot: Under the tutelage of Rocky Balboa, newly crowned light heavyweight champion Adonis Creed faces off against Viktor Drago, the son of Ivan Drago. Starring: Tessa Thompson, Michael B. Jordan, Sylvester Stallone, Dolph Lundgren. 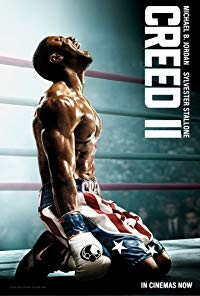 distributed by MGM «Creed 2» in the US movie theaters released on November 21, 2018; dvd and blu-ray release date was set for March 5, 2019. Rent from Netflix and Redbox from March 5, 2019. «Creed 2» in the UK released in movie theaters on November 30, 2018. The movie released on dvd and blu-ray on March 25, 2019.